Warts are growths on the skin that are caused by a blood borne virus called HPV. Because warts are caused by a virus there is no guaranteed cure.Veruccae warts are warts that occur on the soles of the feet. Warts appear over a period of time and can increase in size. They can disappear quickly with correct treatment, but may remain if left untreated. Common warts look like little cauliflowers that are greyish in colour. Flat warts are usually the same colour as your skin, and look like an extra bit of raised thick skin. And usually presents as a small patch or a disc. They are commonly found on the backs of hands, and sometimes the faces of small children and young people. Plantar warts are warts that are found on the bottom of our foot. They grow inwards because of the pressure of standing on them all the time. Warts are generally painless but may cause pain or discomfort when located on the underside of your foot or between your fingers. Warts are contagious, so other people should be wary of catching them, and avoid touching. If you do have warts don’t scratch or pick at them, as this can spread them to another area of your body. Keep the area really clean, wash your hands often and dry them carefully. When you have warts it’s a good idea to use your own special towel as not to spread them. 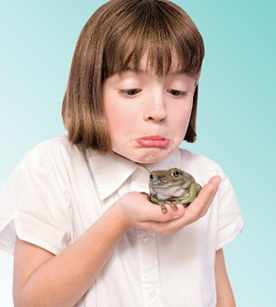 Unfortunately kissing toads does not cure warts, nor do the toads turn into princes! Our Podiatrists can diagnose and provide treatment for warts or any other problems your child may encounter. We have a large number of treatments at our disposal. Yes, we even have proven natural treatments that work!